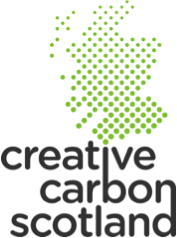 Creative Carbon Scotland is a partnership of arts organisations aiming to put culture at the heart of a sustainable Scotland. Our vision is of a Scottish cultural sector that is a key player in shaping a sustainable Scotland through the work it makes and presents, through the way it operates and through both what it says and how it speaks to the wider public. 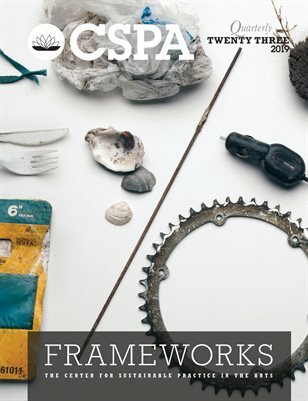 We provide support to arts organisations and individuals in practical carbon measurement, reporting and reduction, including direct training, one-to-one support and a unique website with tips and resources for carbon management in the arts. 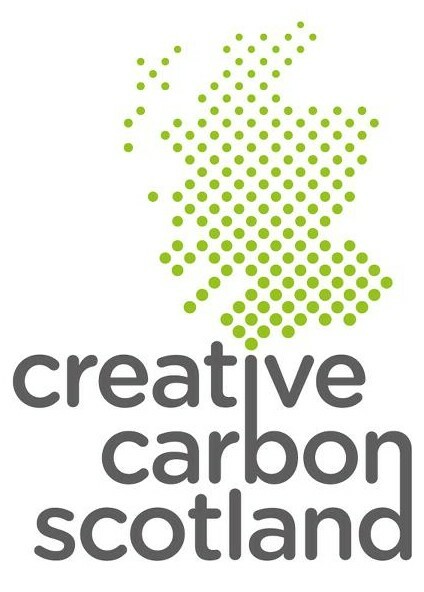 This will increase in 2014 in line with Creative Scotland’s recent announcement that recipients of their funding will be asked to report their carbon emissions from 2014/15 onwards. 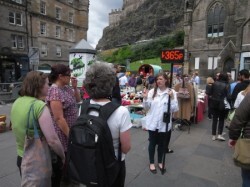 We collaborate with partners on artistic, audience facing and research projects aimed at engaging the sector and the public in shaping a sustainable Scotland. 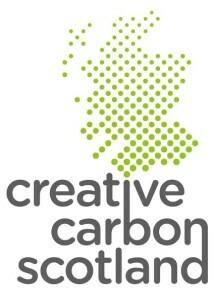 For more information about our work, go to www.creativecarbonscotland.com. 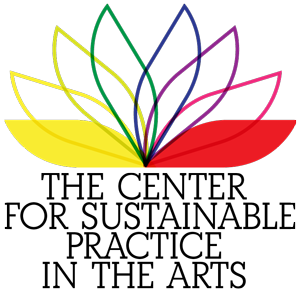 CCS is keen to broaden the diversity of its Board and staff membership and will particularly welcome applications which will help achieve this. For more information, please contact Ben Twist on ben@creativecarbonscotland.com or 0131 529 7909/07931 553872. To apply, please send a short statement of why you would like to join the Board and a copy of your biography or CV. 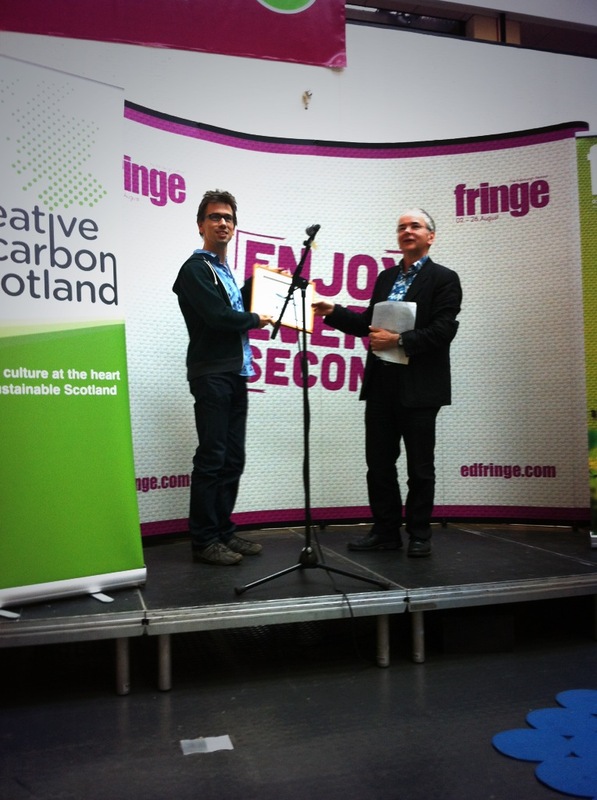 The post Opportunity: CCS Board Members Required appeared first on Creative Carbon Scotland. Sat. 10th August. We dug back into the question of the role of the artist, in particular working with other disciplines such as scientists and public engagement professionals. The discussion flagged a couple of slippages: one towards science and another towards public engagement. These are points of blurring – things that the artist might be doing. 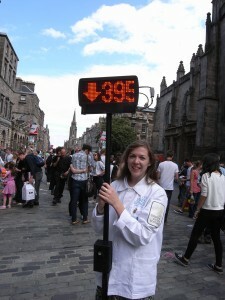 For example, CO2 Edenburgh involves environmental monitoring and this has been developed between the artists, Tim Collins and Reiko Goto, and Creative Carbon Scotland, Ben Twist and Gemma Lawrence). Both teams have specific skills in this area. 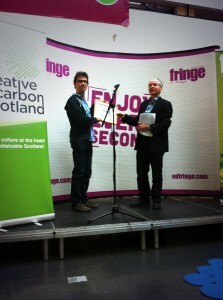 CO2 Edenburgh also involves public engagement and both teams have specific skills in that area. 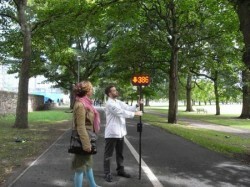 So the Carbon Catchers walking the streets of Edinburgh and stop to take readings and talk to people;, the install in the Tent space at Edinburgh College of Art is like a lab studio combination with data on maps on walls. Both of these tactics are designed to make the monitoring very visible and engaging. Both are also elements that we might find in other activist art projects. But this needs to be set against claims for art. 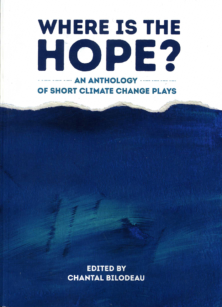 If we want to make claims for the role of art in relation to the social and environmental, and in particular to make a case for high level involvement, then we need to be able to articulate the distinctive contribution, otherwise the role of the artist could be replaced by the environmental scientist or the public engagement professional. So let’s just note that one of the things Tim Collins and Reiko Goto highlighted is that it feels like CO2 is a talked about as a bad thing in public discourse at the moment. It’s also talked about as a very abstract thing. One of the messages that has been used in campaigns to influence the public in the UK as been “Act on CO2”. There’s a danger that CO2 become like smoking or drink driving. There’s another connected issue with CO2: the climate change discourse focuses on specific thresholds 350 parts per million, 400 parts per million. The environmental science that monitors climate change ‘flattens’ and abstracts CO2. The importance of this point came home when Joel Chaney, one of the panellists, mentioned in passing that the national grid, the infrastructure by which we move electricity from the point of production to the point of consumption, requires ‘grid stability’, again ‘evenness’. Tim Collins and Reiko Goto’s central focus in recent work is empathy. The work Plein Air that they installed in the Tent space in the spring (and is an ongoing project) seeks to enable us to experience trees breathing as a means to engage us empathetically with trees. 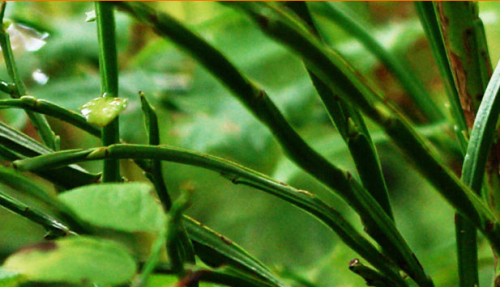 Of course trees are other living things which we know, experience, and understand (reasonably well). Some people have planted and nurtured trees. Some people have pruned or cut down trees. CO2 on the other hand is a molecule, something which we, particularly if we focus on the science, can’t experience. On the other hand if we begin to pay attention to the locally specific then perhaps we can experience – the stuffy room, the fresh air, etc. And as Simon Beeson noted that experience of CO2 should inform architecture – thinking about CO2 in the environment of buildings. Perhaps, as Tim Collins pointed us to, we need to deeply engage with the shift from Subject Object (me and CO2), to Subject Object Environment (me, CO2 and the interrelations embedded in the environment). One of Scotland’s great scientists, James Clerk Maxwell, was at the forefront of a shift from looking for evidence to looking for interactions. But we need to go back to the top – trying to understand what it is that the artist ‘does’. Another trope is to talk about the artist as a storyteller. This is in danger of being a slippage towards the public engagement we mentioned above. Wallace Heim, another panellist, started us off with Alan Badiou and the importance of events. For Badiou there are four critical forms of event – love, politics, art and science. For Badiou these forms of event change our perception of reality in a way that require us in the future to act in ways that are true to that event (so we are not talking about everyday politics, science or art, but those moments when something is revealed and understood). Badiou is of course not writing about art, not trying to tell us what art does distinctively. Rather he’s attempting to describe something about life, something fundamental about being human. And art is part of that, for Badiou enscribed at the heart of it, but not exclusively. So we believe that artists can change things (Tim Collins and Reiko Goto talk about three aspects to art, the lyrical, the critical and the transformative). But the difficulty is that science, public engagement, politics (and love) also change things, transform them. What we want to be able to do is to understand and share the ways that artists such as Collins and Goto, Helen Mayer Harrison and Newton Harrison, Amy Balkin, Hans Haacke, Suzanne Lacy operate because they can make a significant contribution to deep social and environmental issues. We also don’t want to let that potential contribution be reduced to a description of storytelling, or public engagement, or public science, or creating spectacular events. But we also don’t want to set it on a pedestal as magic.